When performing e-tuning or diagnostics, you will need to provide us with “logs”. These logs hold crucial information for the tuner to help dial in your tune and\or troubleshoot any mechanical\tuning problems. With that being said, the way you perform the log (driving conditions) and how long you perform the log aids in the review process to help you that much quicker. We will go over how to perform your logs in this page as well so the data is easily reviewed. Click on the Live Data tab and you will find parameters that are already pre-selected. Anytime the ROM file is opened the parameters reset themselves and will need to be selected or deselected based upon what we ask you to log. 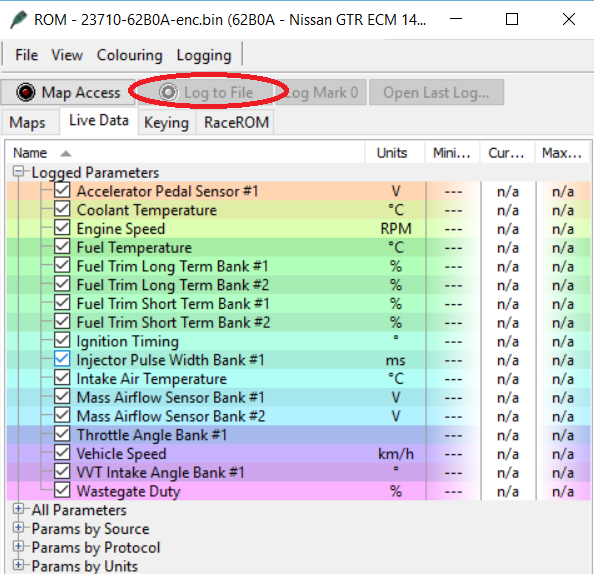 This parameters we wish for you to log vary on the vehicle so this will be e-mailed to you directly when you are ready to perform logging. Please ensure you log ONLY the parameters we ask you to. No more no less! The parameters above are only an example image not what you should be necessarily logging! You can see the check boxes next to the parameter. Un-checking them will remove the parameter from the “Logged Parameters” drop down. Opening the “All Parameters” drop down will allow you to access additional parameters requested for logging and also allow you to re-select a parameter should you have accidentally deselected it. Next we are ready to connect to the ECU. In the screen shot above you will see the MapAccess button circled. By selecting this button, you will connect to the ECU. Ignition must be ON (engine can be ON or OFF) to do this. 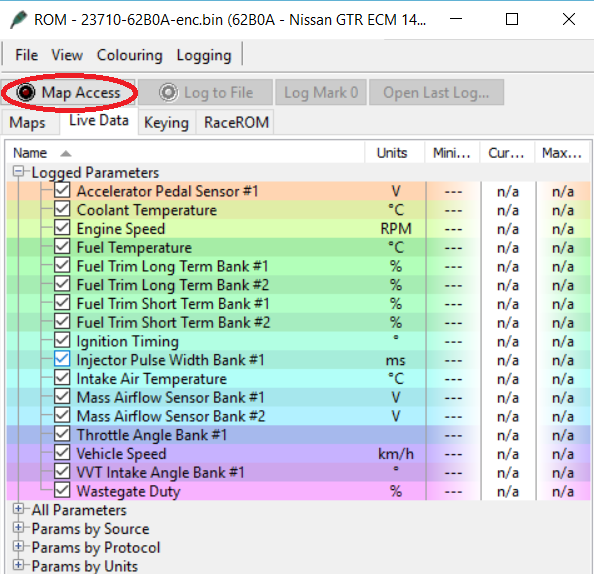 If successfully connected you will see to the right of the parameters values and also a moving red fill line across the upper portion of the parameters box. You can rename the files if you like to help differentiate that particular log from others. This way we know if it was a idle, cruise, or WOT log. Which now moves us to the logging procedure. Once you receive the screenshot of what parameters to log for your application you will be asked to first send us an idling log. Send us a log of idle for about 2-3 minutes of recording. From there you can perform a log of cruising\driving as any normal human being would on the street. Please keep each log no longer than 2-3 minutes. It is OK if you send us various cruising logs since there are various driving conditions that will be experienced (surface streets, highway, etc…). We will advise you on when to perform a power pull or WOT (wide open throttle) log. Naturally aspirated vehicles can usually perform this log on the initial base tune. 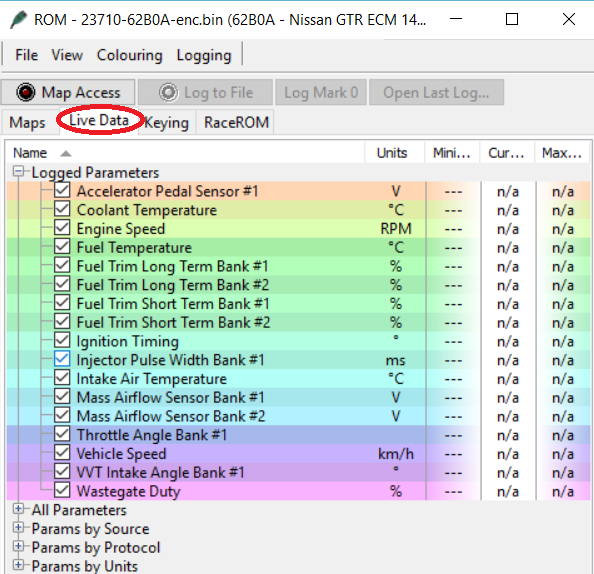 On forced inducted vehicles it is imperative that you get permission to do this first to make sure the idle\cruising logs are confirmed and no updates are required. Slow and steady is the key! When performing the WOT log it is ideally to be done in 3rd and 4th gears where permitting. WOT runs of 1st and 2nd gear will not provide enough load. Also make your WOT log of one pull only.